Today’s guest author is Ben Fash from the Golden Gate National Parks Conservancy, the nonprofit partner of the Golden Gate National Parks. The Parks Conservancy was the recipient of a Google Earth Outreach Developer Grant, funded through the Google Inc. Charitable Giving Fund at the Tides Foundation. We are excited to showcase the Parks Conservancy’s innovative use of Google Earth and KML tours. The Golden Gate Bridge’s 75th anniversary celebration recently culminated in a waterfront festival, and hundreds of thousands of people joined hands on Crissy Field -- a beautiful 100-acre national park site at the foot of the bridge. As we celebrated the bridge with the community on Crissy Field, we also celebrated 11 years of the restoration of the cultural and natural resources at this site. Few people remember that when the Golden Gate Fiesta was held on Crissy Field to open the bridge in 1937, the community was standing on an army airfield, which was subsequently abandoned and served as a dump for many years. 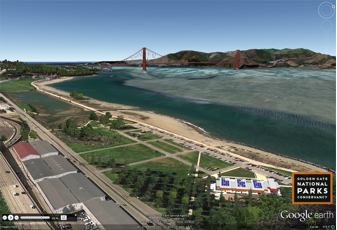 In our new Google Earth tour, “The Transformation of Crissy Field,” television journalist Doug McConnell walks through the history of Crissy Field, with a focus on the community-led restoration effort completed in 2001. The tour includes photos, historic maps, drawings, and satellite imagery with animated SketchUp models to create a virtual journey through the changes from a diverse salt-marsh ecosystem to race-track, army airfield, dumping ground, and finally to beloved national park. It also shines a light on the Crissy Field Center, a dynamic hub of youth engagement for the Golden Gate National Parks. A partnership program of the Parks Conservancy, National Park Service, and Presidio Trust, the Center has served hundreds of thousands of youth in its ten years of existence, with a focus on those who traditionally have had little—if any—access to national parks. Just as Crissy Field itself serves as an outdoor classroom for youth, the Google Earth tour serves as an educational tool to inspire new generations with this brilliant story of what is possible when a community rallies to create welcoming public space. At the foot of the Golden Gate Bridge, Crissy Field is a story of transformation. We believe it is the duty of all human beings to protect ecosystems that are vital to our own survival and that of the other species with whom we share this planet. Now in the 21st century, it is critical that communities join hands to restore the damage that has been done to the environment, reversing trends that have been set and reviving a love for the lands and oceans that we depend on. It is our hope that the story of Crissy Field will serve as an example and will inspire many people to contribute to the stewardship of their own public lands. We welcome you to visit us online to learn more about our work and how to get involved in the Golden Gate National Parks. While you’re there, view the narrated tour, or download the KML to view it interactively in Google Earth! Editor’s Note: Today’s guest author is Ben Fash from the Golden Gate National Parks Conservancy, the nonprofit partner of the Golden Gate National Parks. The Parks Conservancy was the recipient of a Google Earth Outreach Developer Grant, funded through the Google Inc. Charitable Giving Fund at the Tides Foundation. We are excited to showcase the Parks Conservancy’s innovative use of Google Earth and KML tours.